For boat weights I used the FISA minimum weight requirements and I assumed the coxswain to have a weight of 55kg. Some of the lightweight athletes have not published their weight on the FISA pages, so for them I have taken the maximum average crew weight (70kg for men and 57kg for women). I do not have data for all disciplines, as some of the finals were run on Saturday. I have no clue about the weather on the Saturday, but it seemed there was some wind, as all times were on the slow side. The model was used to estimate the average power (per average crew member) assuming a flat race. In reality, the average power may have been up to 10% higher if the crew rowed at different speeds in different parts of the race. The calculated crew power amounted to 6.9±0.2 Watts/kg for the men and 5.4±0.2 Watts/kg for the women. Comparing this with data I found for cyclists, this looks very realistic. It places the world’s best rowing crews of 2010 in the same league as ‘world class’ cyclists in 2005. It is also encouraging to see that the watt/kg index seems to be independent of weight for these data. I didn’t find any data for women, but women I presume the difference is (at least partly) explained by the difference in body fat percentage between men and women. I tried searching the internet for ‘men women power relationship’ but that yielded results from an entirely different field. I’d be happy to find any better data. I have no easy access to academic literature and no background in sports physiology, so this is the best I can come up with. 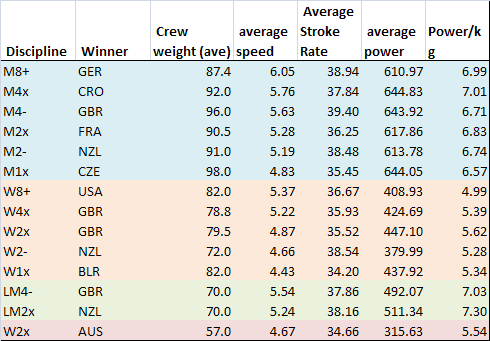 In conclusion, the predictive power of my model tested on rowing world cup finalists seemed quite good.